Small Business Account Reconciliations ... Are They Necessary? Today we are chatting about account reconciliations ... the fourth item in my list (see below) of good bookkeeping practices . We are going to look at what reconciliations should done, how often and why they are an integral part of your accounting procedures. I'll also walk you through how to perform a vendor reconciliation. Why is it important to do account reconciliations as part of your small business accounting procedures? The purpose is to verify that you have recorded everything and that your small business accounting records are accurate ... so you will know you are making decisions from good information. An added benefit of doing your small business account reconciliations monthly is they assist in fraud control. Reconciliations are a very simple and basic small business accounting internal control procedure to implement. I was taught that if you ensure your balance sheet accounts are correct, your income statement has to be right ... it can't be wrong. What account reconciliations should be done to verify the accuracy of your accounting records … and how often? Bank statements, credit card statements, and vendor statements should be reconciled monthly. And don't forget to reconcile your loan account or your line of credit account. You may want to consider assigning all other balance sheet accounts a quarterly review. The idea is to smooth out your work flow. 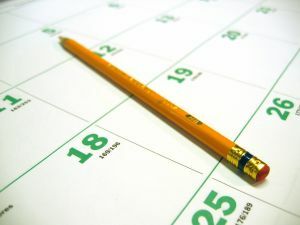 Divide and assign an equal number of accounts to be reconciled each month over a three month period. If done right, every balance sheet account is reconciled at least four times a year. This ensures that come year-end, you are ahead of the game. If your record keeping isn’t up-to-date, where do you go to see if you have enough cash on hand? You certainly can’t be relying on your financial statements. You haven’t kept the information up-to-date. I’m guessing your bank statement or online balance? Are you sure that’s an accurate account of your cash balance? Account reconciliation of all of your bank accounts is imperative. Ask yourself, "What information is missing when you look at your bank statement or online balance?" It's easy to forget but ... what about those cheques you put in the mail yesterday or the online bill payment you setup to be paid at the end of the week? How about that bank deposit you have that hasn’t made it to the bank yet? And this one is my own pet peeve, the person who deposits a cheque you wrote four months ago! They couldn’t get to the bank before then? It is pretty important that you make time to balance your bank statement to your books monthly because every decision you are making is based on the cash you have on hand. 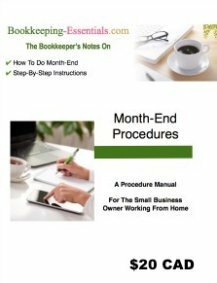 A monthly bank reconciliation is a good bookkeeping practice. To say it another way, it is an account reconciliation of your general ledger to your bank issued statement. With all the electronic transactions possible today, the bank reconciliation checks that all debit transactions and preauthorized deposits and withdrawals going through the bank account have been recorded. There is the possibility of charge backs (NSFs) and interest on lines of credit or demand loans that the bank could have processed on your account. Don't forget the bank service charges have to be recorded in your ledger when the bank statement is received. The purpose of reconciling the bank statement each month is to ensure you have caught and recorded all bank transactions in your ledger. If you find transactions that haven't been posted, then part of the reconciliation process is to post those transactions. 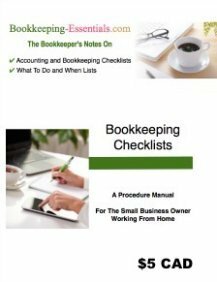 Even if you have the bookkeeper prepare the bank reconciliation, you as the owner need to review the bank reconciliation regularly to ensure fraud or embezzlement is not occurring ... not to mention checking that good bookkeeping practices are being followed by your bookkeeper. ... one of the things you are aiming for is to have accurate and timely financial statements from which you can make sound business decisions. A few suggestions on how to be on the lookout for fraud ... incentive to you as a business owner to always ensure your bank reconciliation is done EVERY month. Bank reconciliations are one form of account reconciliations. To give you an idea of what you are trying to do, here is an explanation and example of the bank reconciliation. Bank errors (increases or decreases the bank statement balance) - Make sure the bank has been notified and that the bank is going to be correcting the error. Outstanding cheques (decreases the bank statement balance) - Keep an eye out for cheques that have been outstanding for more than six months as the bank does not have to honor them, unless certified. These are referred to as stale-dated cheques. They should remain on the bank rec unless they are cancelled or re-issued.What if for some reason your bank rec has staledated cheques still outstanding from prior years? Transfer them through a journal entry to a suspense account for your accountant to deal with (you have one don't you?). Your accountant may decide to recognize the cheques as revenue. Bank service charges (decreases the company's bank balance) - Includes service fees for overdraft charges, stop payments, monthly service charges, interest charges, a new cheque order ... the list goes on. These need to be journalized to your books by debiting bank service and interest charges and crediting your bank account. Interest earned (increases the company's bank balance) - This needs to be journalized to your books by debiting your bank account and crediting interest income. Chargebacks, returned, bounced or NSF cheques (decreases the company's bank balance) - Look for instructions in your software program on how to enter the non-sufficient funds cheque and reissue an invoice to the customer for the amount including service charges. Part 1. Your general ledger shows a bank account shows a balance of $1270 at month-end, before you perform the bank reconciliation. Part 2. The bank statement shows a balance of $1980. Part 3. The bank reconciliation shows outstanding cheques of $2,246, bank service charges of $36, an overdraft charge of $75, and $1,425 deposit in transit. What is the adjusted balance? Part 3(a). The general ledger balance $1270 - bank service charge $36 -overdraft charge $75 = $1159 adjusted general ledger balance. You are trying to adjust the general ledger account by any entries recorded in your bank statement that have NOT been recorded in your general ledger. Part 3(b). Bank statement balance $1980 - outstanding cheques $2,246 + deposits in transit $1,425 = $1159 adjusted bank statement balance. You are trying to adjust the bank statement by any entries recorded in your general ledger that have NOT been recorded by the bank due to timing delays. As you can see, this bank account reconciliation is now balanced because the adjusted balances for Part 3(a) - the general ledger and Part 3(b) - the bank statement equal each other. To complete the bank reconciliation, you need to record / book the adjustments listed in the solution of Part 1. How do you reconcile vendor statements to your accounts payable ledger? The same way you would a bank statement or credit card statement ... so don't throw those statements away!!! One way is to begin is by opening your vendor sub-ledger. Your account balance should be equal to the vendor statement. The other way is to run your Aged Accounts Payable Report to get your vendor balances at a particular date ... say the date of your vendor statement or the end of a month. Print off the vendor account from your accounting system. Then get a colored highlighter (or a red pen for check marks). If it makes it easier for you, you can use a different color highlighter for each step below. On your printed report, highlight (or check mark) all vendor invoices that match the vendor statement. Circle any invoices on your vendor statement that are not recorded on your vendor report. Now, on your printed reported, highlight (or check mark) all payments you made that are showing on the vendor statement. Circle any interest or late payment charges on your vendor statement that are not recorded on your vendor report. Circle any vendor payments on your report that are not showing on the vendor statement. In an Excel spreadsheet type (or write on the vendor statement) the following descriptions in column A and the corresponding number in column B. Column A Vendor Balance - Column B Enter (write) in the vendor closing balance from the vendor statement. Column A Outstanding Invoices - Column B Subtract the circled outstanding invoices and missing interest charges on the vendor statement. Column A Payments in Transit - Column B Subtract the circled payments in transit from your vendor report. Column A Book Balance - Column B Total the above. The total should equal your vendor report. Print the Excel spreadsheet to attach to the vendor statement ... or save the file under vendor reconciliations. Post the outstanding invoices to your vendor account if you are confident they are valid. Phone the vendor and request a copy of the missing invoice(s) if you can't find it in your paperwork. Address any discrepancies with the vendor as soon as possible to avoid late fees or loss of discounts. If you are using QuickBooks, use Enter Bills (not Write Cheques) to post the missing invoice. Make a memo note to reference the vendor statement and that a copy has been requested. Post any unrecorded interest or late payment charges to your vendor account. As you perform your vendor reconciliation, be on the lookout for duplicate payments and outstanding credits. Pay particular attention to items on the statement that are not current. It means there may be a problem. For example, if you don't have an invoice for an item that is already 30 days plus outstanding, call and get a copy of that invoice. As a general rule, a good small business accounting practice is not to pay vendors off a statement. Pay only off of an original invoice, not invoice copies. There are exceptions to this rule. You can also use this method to reconcile your loan account or your line of credit account.